The Shire Works Crew is responsible for maintaining Council’s parks, gardens and reserves, and 120km of sealed and 765km of unsealed roads. Each year the Shire allocates a significant portion of its budget for road construction works. This work includes the reconstruction of gravel roads and the bitumenising and resealing of roads. 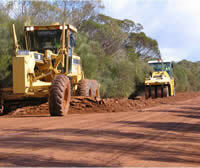 Road construction works are undertaken by Shire staff and private contractors. The Shire is proud of its parks, town gardens and reserves. The Shire employs a full time gardener who works closely with other Works staff to maintain and develop the Shire’s parks and gardens. Westonia has an unsealed airstrip located near to town which is regularly used by the visiting Royal Flying Doctor Service and others. For information about the airstrip contact the Shire Office on (08) 9046 7063.